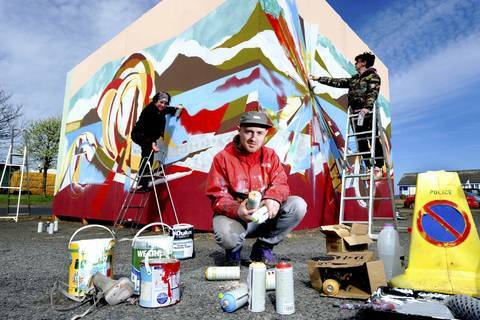 Spring Fling Rural Mural is back and this time it's going International! Spring Fling Rural Mural was launched in 2014 to huge acclaim and appreciation. The project saw 11 artists collaborate to produce numerous large murals across the region on buildings, vehicles and unusual objects. Upland has again joined forces with urban art specialists, Recoat, to grow and evolve this innovative project. 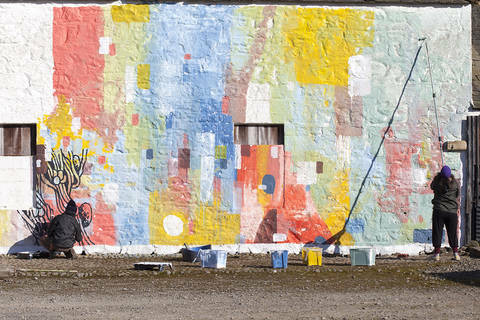 Spring Fling Rural Mural (#SFRM) will see a collective of local, Scottish and international artists paint large-scale murals at rural sites across Dumfries and Galloway for Spring Fling 2016. Having put out a call for artists and a call for sites, we received an influx of both artists wanting to take part, and site owners coming forward to offer their garages, barns, steadings etc. 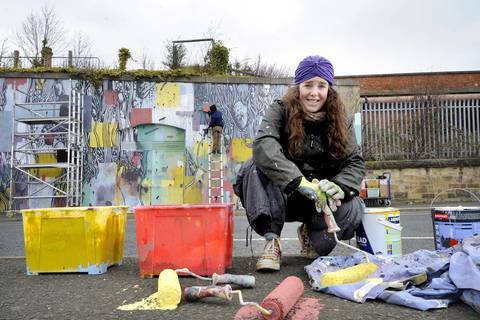 Since then, three Upland artists have been paired with three Recoat artists, with each pair creating a mural in Dumfries and Galloway and in a city outwith the region. So who will be painting these Murals? Upland artist Morag Macpherson (textiles & screenprinting) will be working with Rome based Recoat artist Tellas. 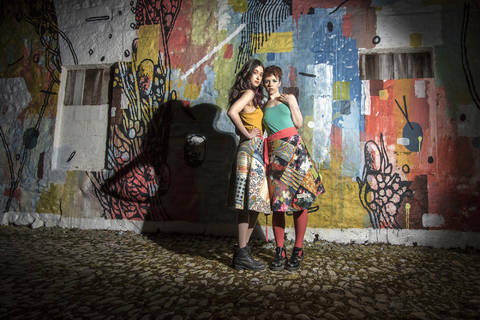 This pairing will paint a mural at Meiklewood Farm, Ringford then head to Newcastle where they will take the rural to the city, painting another mural. Upland Artist Rory Laycock (installation) is working with Berlin based duo 44 Flavours at Mossburn Animal Centre, Hightae and taking SFRM to Berlin and a wider European audience. Upland artist Morag Paterson (photographer & painter) has been paired up with Amy Whiten & Ali Wyllie of Glasgow based Recoat. This collaboration will be working on a mural in Moniaive at the Craigdarroch Arms Hotel and then at a site in Glasgow! During the project a film was commissioned to document the process. 'What Are We Doing Here' by Afternoon Pictures follows the painting of three new collaborative murals in the Dumfries and Galloway countryside, and three more in the urban hearts of Glasgow, Berlin and Newcastle. The film explores the exchange of skills and knowledge between artists, urban to rural in artform and sites, the journeys the artists travelled both home and away and the offering of art to site owners who offered up their sites in return. We are delighted to confirm that Emma's film 'What Are We Doing Here' will feature as part of the Krafta Doc International Film Festival which takes place in Glasgow from 27th September - 1st October 2017. To get a taste of Emma's film, click here to watch the trailer. To watch the full film, click here. The Mossburn Animal Centre, Hightae. The mural will be on the side of a large, stone farm building at this centre for ill-treated and abandoned animals. It is visible from B7020. 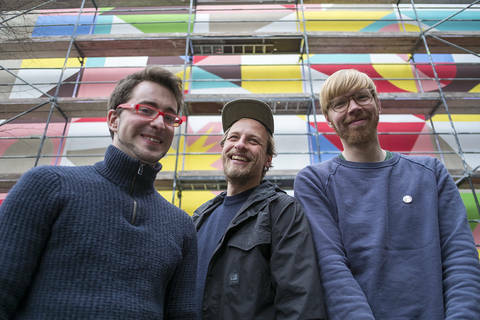 The creators will be Berlin-based arts duo 44 Flavours (Sebastian Bagge and Julio Rölle) and Dumfries and Galloway visual artist Rory Laycock. Meiklewood Farm, Ringford, Castle Douglas. 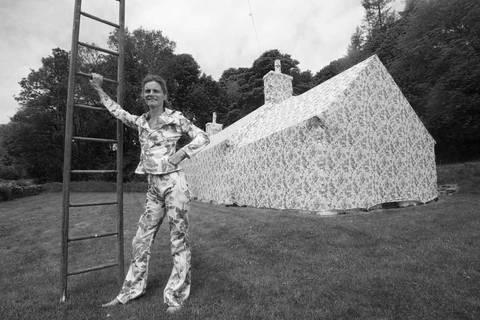 Tellas, from Rome, will team up with Kirkcudbright-based Morag Macpherson to create a mural on a large steading near the A75. Craigdarroch Arms Hotel, Moniaive. Amy Whiten and Ali Wyllie from Recoat in Glasgow will collaborate with Morag Paterson from near Thornhill. Their mural will be on a gable end at a pub renowned for hosting arts events. Art and fashion have come together to show off fabulous fabrics ahead of the annual Spring Fling open studios weekend. Launch marks completion of biggest project so far for group showcasing Dumfries and Galloway art and craft. 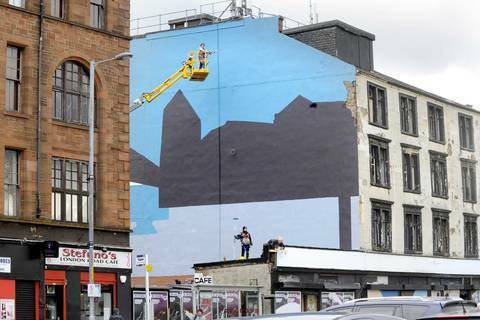 The Rural Mural team behind a series of bold new artworks in the Scottish countryside is working on its latest creation – in Glasgow. 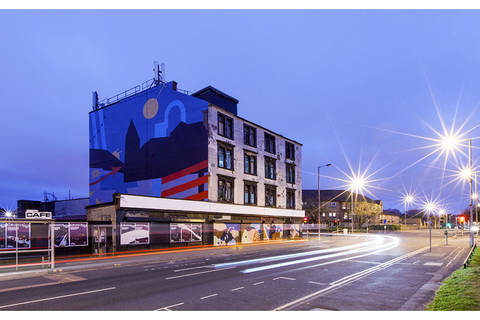 Press release: Artists from Italy and Scotland have created a large-scale mural at Newcastle’s Toffee Factory as part of an international project. 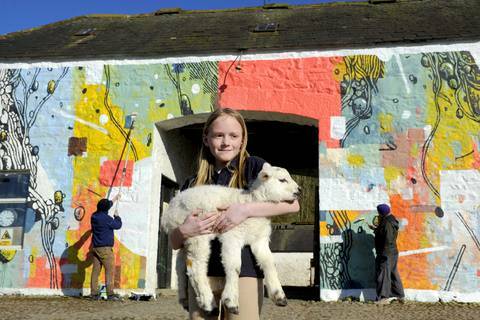 German, Italian and Scottish street artists to create colourful artworks on a farm building, animal refuge and village pub.